The OM is the language of the aura. You can cleanse and purify your aura simply by manifesting the perfection of the OM. Everything that you do affects your aura—your thoughts, your emotions, your consciousness. 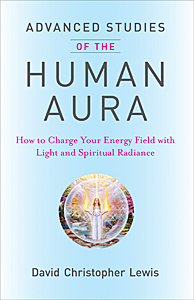 The aura is usually, for most people, in a state of flux, ever-changing based on your mental meanderings, the energies of the environment affecting you, where you live, the force fields of the planet, the radio frequencies that interpenetrate. Your aura is an electronic signature of who you are. The colors of the aura are either glowing and shining and radiating joy, vitality and the effervescence of your beingness as you live in your Presence1 and maintain a state of blessedness and beingness in God. Or the colors may be dulled, contracted and stultified when you are gloomy, when you have the doom consciousness, when you complain or see life as less than beautiful. So the choice is up to us every moment whether we are radiating God Consciousness in the purity of beingness or whether we, by our consciousness, would allow something less than God through the ego nature. Appreciation intensifies the aura in the heart with the glow of pink and a sunlike radiance.And when at times we enter into self-deprecation or others hold images and concepts of us based on some human frailty or their perception that is less than the Christ of who we are, those vibrations can, if we are not strong, influence us. And so at times we need to assess where our aura is vibrating. Are we joyous, are we in harmony, are we in balance? Your diet affects your aura, of course, but, more importantly what you take in in consciousness through your eyesight, through your consciousness. So if you would increase the stature of your aura, the radiance, the colors manifesting a greater glow and fire, then focus on the positive things of life. Put your attention upon God, love. Behold the spinning of your chakras which create the resonance within you whereby your aura can be cleansed, purified and expanded. The chakras are like little generating stations, power stations within you that allow you to be living in many dimensions and planes of being simultaneously and yet at harmony with the Divine. They are like the mitochondriatic powerhouses within the cell that science and biology tell us of. And these little substations of light can be for you a great self-regenerating focus. As you focus on each one, see the petals of those chakras spinning. See the radiance of light of these generating stations blessing yourself and all those who come within your circumference. As we pray with intention and love, there is emitted through our chakras and from our aura, the light of our being. And the quality of your prayers is dependent upon the quality of your heart, your mind, your consciousness. If you would like greater effectiveness in your life, first go within, self-assess and get in balance because if there is a certain amount of your consciousness that is out of kilter with beingness, then all of the prayers that you utter will be in some way affected by and conditioned by your consciousness. When you are one with God and the universe, then that which comes forth through you allows the universe to be sustained in that oneness and balance. But, when you are not fully whole because of thoughts of others that are less than perfection, inharmonious [feelings], criticisms—even held within the mind or the emotions and never verbalized—these become a drag upon your aura. And if you hold the concept of others as beautiful, shining, radiant, whole, then you will help that one to fulfill that prophecy that you hold within your being for them and, really, for their aura. Appreciation brings a greater love and forgiveness, compassion. And so, at times, we need to enter into this ritual of appreciation because there is, through acceptance and through grace, the cleansing even of our auras by this sacred ritual. 1. Presence, referred to as our “Solar Presence” in The Hearts Center dispensation, names that part of our being that is God, depicted as the upper figure in “Your Buddha Nature Chart.” The Solar Presence is also called the I AM Presence, the Divine Presence, the God Presence. It is the individualization of the One, our true divine identity. In the wording “Solar Presence” we see the image of our total being as a radiating sun center which continually emanates divine love and every virtue to all life.